It comes as no surprise that we have yet another recipe based in phyllo. Phyllo is one of the greatest inventions within the food world. It’s buttery flaky and carried the sweet savory flavor combinations so well. 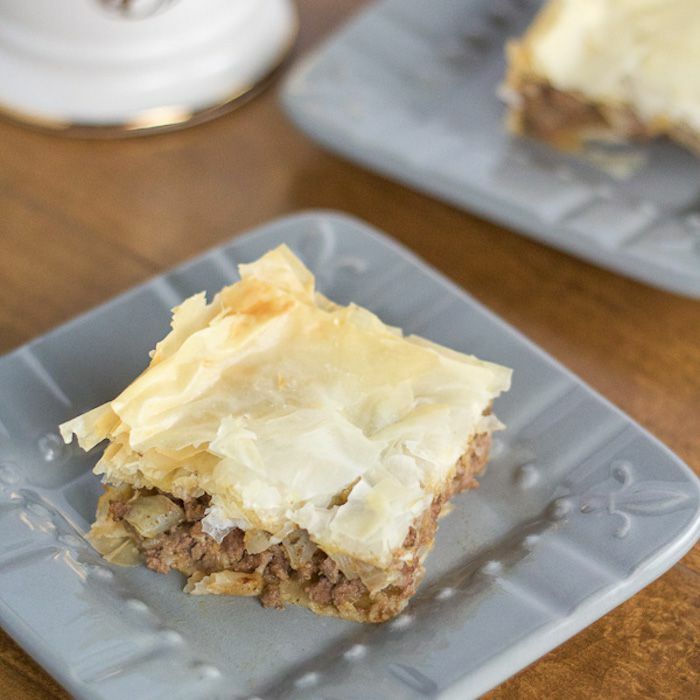 This tasty Greek meat pie, which is called kreatopita (κρεατοπιτα), is a perfect example of the versatility of phyllo. From baklava to this, it’s can just do so much and taste just as delicious. The traditional kreatopita gets spruced it up a bit here. While some dishes call using leeks or rice, this version is a different method that reduces the meat in 2 different kinds of liquid to really pack on the flavor. The reducing method really gives the meat mixture a nice taste. With the added herbs and light acidity from the tomato paste, you get a balanced yet complex bite that will have people reaching for seconds. Feel free to swap out some herbs to include the ones you like. Once hot, add in the onions cook until soft and translucent, about 5 minutes. Next, add in the ground beef, break apart and brown. Once the meat in brown, add in oregano, dill, pepper, some salt, and tomato paste, mix everything together. Add in wine and reduce. Add chicken broth and reduce. Once all liquid has been reduced, remove from heat and empty into bowl. Add in the feta and egg - mix well. Unroll the phyllo sheets and lay them flat. Cut the phyllo sheets to match the size of your baking dish. Brush with some melted butter and lay another sheet down of phyllo. Brush that with butter and repeat 6 more times (phyllo, butter, phyllo). After the 8th phyllo sheet, pour the meat mixture into the pan and smooth out evenly. Now, repeat steps 14 -15, placing 8 more phyllo sheets over the meat mixture. When done, score top and place in oven for 20-30 minutes, or until golden brown. Remove, cut, and serve hot! Notes: *You’ll only use 1 roll. Save the 2nd for another day. **A 9 x 9-inch pan was used here. ***Keep the phyllo you're not using covered with a damp towel.